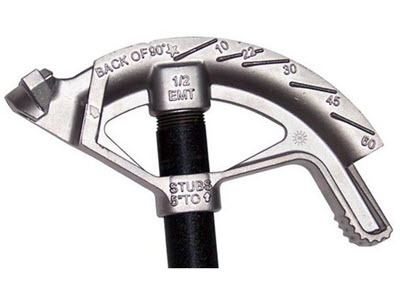 Conduit Benders - Easy to use and lightweight conduit bending tool. - Lightweight Aluminum for easy handling. - Markings are raised cast into the bender body on both sides for visibility. - Deeply serrated step helps prevent slippage when applying force. - Grooved internal hook surface helps prevent conduit from slipping. - Flat hook surface provides stable starting point.